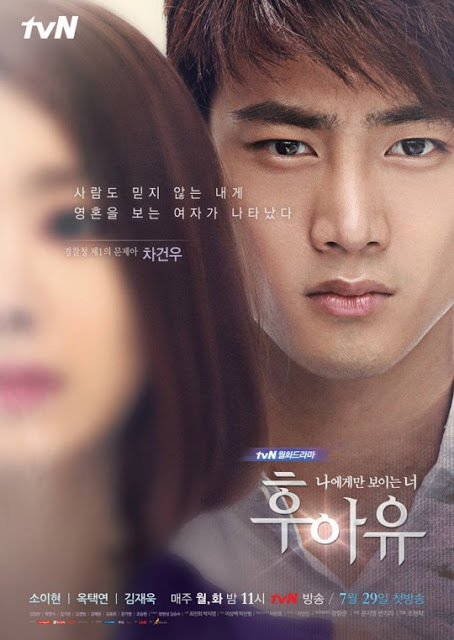 Ghost-seeing dramas are indeed the craze now. I've never understood ghostly love stories, and it's not a genre I'm especially keen on. But Master's Sun was a pleasant surprise, and Who Are You has been interesting though far less impressive. I'm midway through episode 6 and have found that it's about what you'd expect - some jumpy moments, lots of mystery-solving involving tragedy and misunderstanding, and of course that tragic ex-boyfriend lurking in the back. It's not an addicting watch, but is entertaining and low-key. The episodic mini-arc structure is almost identical to Master's Sun. It always starts with a mysterious ghost that begins following our heroine, who then tries to deny it (with some excessive reactions in my opinion) but ends up helping them and reaching some emotional conclusion. But there's no humor here to undercut some of the dreariness, so the story ends up feeling one-note and dry. I did like the smiley, eccentric ghost in episode 5 though, which was an interesting change-up on the typical scary and depressed spirit. The biggest weakness so far is the acting from the two leads. I don't think either of them were ready to carry a show, and boy is that a big shortcoming. The overacting is off the charts, and it unfortunately doesn't look like either actor will be able to learn much from the other in terms of improving his or her craft. So Yi Hyun was interesting enough in Cheomdangdong Alice, but the one thing I hated there was her tendency to go excessively wide-eyed and shaky while trying to act out "fear." As you can imagine, there's loads more of that here (indeed about every other scene), which means we're stuck with an almost perpetually bug-eyed heroine. And when she's not acting fearful, she's trying to play cool and aloof, which is stiff and unnatural to watch. Taecyeon is a bias of mine since I liked him in both Cinderella's Sister and Dream High. He's replaced the stiffness with an unreal exuberance and tendency to exaggerate his expressions (probably learned from his costar). Together, they're very pretty but flat on the chemistry meter. I don't really care whether they end up together or not, even though they surely will. Despite preferring Taecyeon to Lee Jae Wook (I know, but I've never warmed up to the guy in any of his prior roles), I much prefer Lee Jae Wook's acting to Taecyeon's (not much of a comparison). But we've barely even seen LJW for more than 5 minutes so far, and it's rather strange to consider him a second lead given his shortage of screen time. Not sure this was the best vehicle for his return to acting, but at least he looks good. In general, I have no expectations for this becoming a must-see drama, but it's fine for what it is - a light, slightly spooky mystery drama. I decided to pass on this one. Part of my plan not to overburden myself with airing dramas, but though I like the two leads (or three if you count LJW), I've never really been sold on their acting skills.. Funny, some people tell me "They're amazing!!" while others are just like you. Judging by my own experience watching these actors though, I'm more inclined to go with your judgment. Plus, I don't like spooky lol. Master's Sun is just cheesy enough for me to deal with it. Yeah, out of all the new shows I have to say this is the least interesting of the bunch, so you won't miss much by skipping it. I'm surprised that people think the actors are that good. It's an improvement from their past roles, but there's a lot of space for growth. At least it offers them some good visibility. I would also rate the spookiness as fairly mellow, so no worries on that if you do watch. They're clearly on a very small budget, so it's mainly just make-up and some pop-ups (that aren't even surprising after you figure out the pattern).